The attorney for the CEO of American Media, Inc., denied Jeff Bezos' allegations that the parent company of the National Enquirer attempted to extort and blackmail the Amazon CEO with compromising photographs, the lawyer said in an exclusive interview on "This Week." Add Amazon as an interest to stay up to date on the latest Amazon news, video, and analysis from ABC News. Elkan Abramowitz, who represents David Pecker, defended AMI's CEO in the interview with ABC News Chief Anchor George Stephanopoulos on Sunday morning. "It absolutely is not extortion and not blackmail," Abramowitz told "This Week" on Sunday. "The story was given to The National Enquirer by a reliable source that had been giving information to the National Enquirer for seven years prior to this story. It was a source that was well known to both Mr. Bezos and Miss [Lauren] Sanchez." Last month, the Enquirer broke the story of an extramarital affair between Bezos and Lauren Sanchez, and published intimate texts between the couple. Both Sanchez and Bezos were married to other people during their relationship. This week, The Daily Beast published a story naming Michael Sanchez, Lauren Sanchez's brother, and a longtime associate of members of Trump's inner circle including Roger Stone and Carter Page, as the Enquirer's source. When asked directly by Stephanopoulos if the Enquirer's source was Michael Sanchez, Abramowitz replied, "I can't discuss who the source was. It's confidential within AMI, so I'm not going to answer who the source was. It was somebody close to both Bezos and Miss Sanchez." Abramowitz was responding to jaw-dropping claims by Bezos published on Medium Thursday. The world's richest man called his ownership of The Washington Post a "complexifier," because of the paper's investigation into the death of its journalist Jamal Khashoggi, who was critical of the current Saudi regime before he was murdered. He also referenced the Enquirer's close relationship with Trump, and the Post's critical coverage of the administration. Pecker's lawyer pushed back on questions of wrongdoing and repeatedly stated the magazine's practices were "journalism" rather than extortion, because the Enquirer had already written about Bezos' affair, and claimed that the negotiations over publishing further stories with compromising photos is a normal journalistic practice. "The story was already published," Pecker's lawyer said. "Is it journalism not to print a story three times? The story was out there." He continued, "I think both Bezos and AMI had interests in resolving their differences. Bezos didn’t want another story written about him or those pictures published, AMI did not want to have the libel against them that this was inspired by the White House, inspired by Saudi Arabia or inspired by The Washington Post. It had nothing to do with it. It was a usual story that -- that The National Enquirer gets from reliable sources." 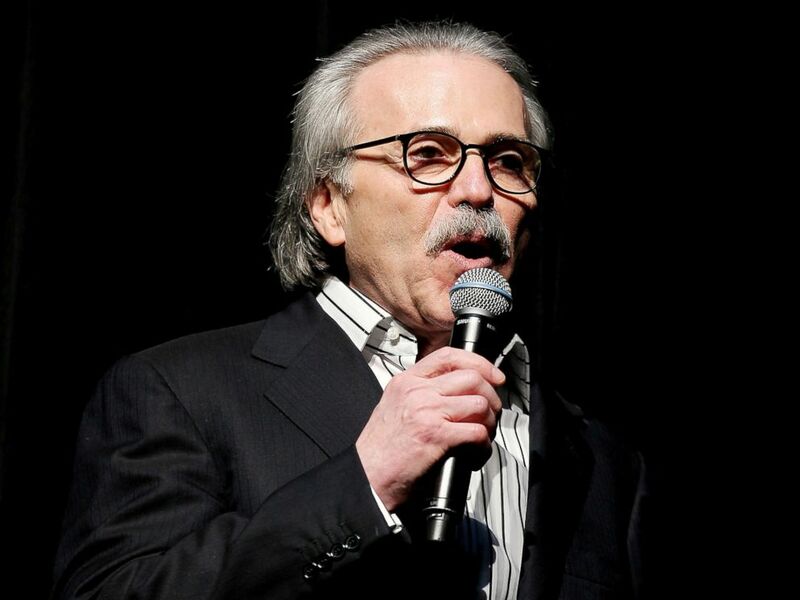 David Pecker, Chairman and CEO of American Media speaks at the Shape and Men's Fitness Super Bowl Party, in New York, Jan. 31, 2014. Asked again if their source was Sanchez, Abramowitz replied, "I’m not permitted to tell you or confirm or deny who the source is. I can tell you it’s not Saudi Arabia, it's not President Trump, it's not Roger Stone." Bezos had also claimed that AMI was trying to curry favor with Saudi Arabia, and that the tabloid's executives were "apoplectic" and "particularly sensitive" about any links to the kingdom. According to The Associated Press, the company produced a 97-page magazine profiling Saudi Crown Prince Mohammed bin Salman that appeared on U.S. newsstands just before the prince's visit to the U.S. in March 2018, which seems unusual for the brand, which does not often cover Middle East affairs. That issue had no advertisements, so would likely not have made much money. In the long Medium post, in which Bezos included unredacted email correspondence between AMI executives and his team, the Amazon mogul suggested that the Enquirer may have published the story of his affair with Sanchez to curry favor with the White House and Trump because of The Post's aggressive coverage of both the administration and Saudi Arabia. Bezos added that, "rather than capitulate to extortion and blackmail, I’ve decided to publish exactly what they sent me, despite the personal cost and embarrassment they threaten." His post revealed the behind-the-scenes back and forth detailing the Enquirer's offer: to refrain from publishing further intimate photos shared by the couple, in exchange for Bezos calling off his own investigation into how the Enquirer got the photos and messages in the first place, while also publicly denying that their publication had any political motive. It was this offer Bezos referred to as "blackmail" and "extortion." After Abramowitz's interview, Alan Dershowitz, Harvard Law professor emeritus and author of "The Case Against the Democratic House Impeaching Trump," argued that the Enquirer's actions were protected by the First Amendment. In January, the billionaire CEO and his wife of 25 years, MacKenzie Bezos, announced that they were divorcing. In a statement released on Twitter, they said the decision comes "after a long period of loving exploration and trial separation." AMI defended its actions in a statement Friday but said it would investigate Bezos' claims. "American Media believes fervently that it acted lawfully in the reporting of the story of Mr. Bezos," the company said in a statement. “Nonetheless, in light of the nature of the allegations published by Mr. Bezos, the Board has convened and determined that it should promptly and thoroughly investigate the claims. Upon completion of that investigation, the Board will take whatever appropriate action is necessary." Federal prosecutors in Manhattan are reviewing the allegations, a source familiar with the matter told ABC News on Friday. ABC News' Wil Cruz contributed to this report.